Bach to the Future: Gabriel Calatrava creates malleable architecture for "The Art of the Fugue" - Archpaper.com Bach to the Future: Gabriel Calatrava creates malleable architecture for "The Art of the Fugue"
The installation, mounted in a 24-foot-by-17-foot frame, is meant to evoke the strings on musical instruments, Bach’s fugues, and a game of Cat’s Cradle, the children’s game played with an endlessly transfigured loop of string. 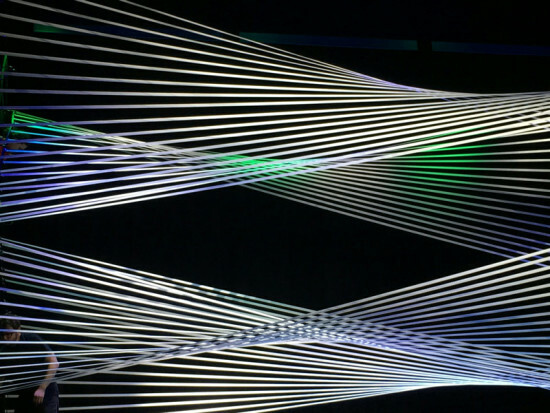 While the Brentano String Quartet performed Bach’s piece live, dancers manipulated Calatrava’s installation in response to the music. 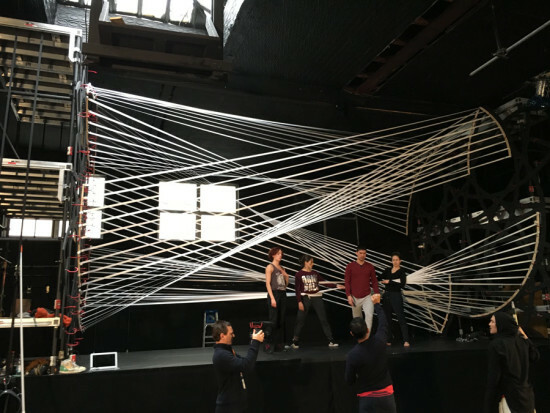 New shapes, spaces, and patterns are created as the dancers work. “My fascination with moving architecture inspired me to design a set piece that serves as both a work of art and a functional installation that reacts to music,” Calatrava said in a statement. In the video below, he dives into the design process and the challenge of syncing architecture, a medium with material products, to music, tangible but non-physical. The Calatrava name should be eminently familiar to anyone who follows architecture. The younger Calatrava, trained as an engineer, is now an architect, working on his own and with his father’s firm, Santiago Calatrava Architects & Engineers. 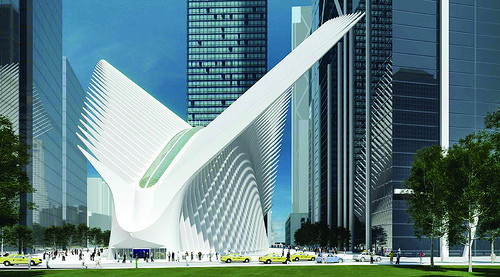 An affinity for white, sinewy geometries may run in the family: the 92Y piece recalls the elder Calatrava’s recently completed Museum of Tomorrow and the soon-to-open World Trade Center Transportation Hub, below. For those interested in checking out more musical pairings, the 92Y’s “Seeing Music” festival runs through February 18.